I started doing investment in stock market last January 2012, and now since Asian economy is booming my portfolio have increased 15% from my capital. You might say that 15% is low if the market is booming and you are right. It is actually low since I am doing trading before rather than investing. When I tried stock market I don’t know the difference between trading and investing, I thought it’s just the same. Through reading, I came to know that trading is like gambling and it is really dangerous while investing is saving for the future by trusting the company where you put your investment. Speculative stocks or penny stocks are the stocks loved or hated by the traders while blue chips stocks are investor’s baby. When I say blue chips stocks it means big companies who have an increasing price based on their history. It is a stable company which are normally suggested by brokers like Citiseconline. Daily while I am bringing my son and daughter to their school, investment is one of our discussions. So yesterday, when I and my son are chatting, he decided to invest his savings to the stock market. My 10 year old son decided to put his 80 Saudi Riyals (850 pesos) in my care by investing to SMPH (I ask him to choose from MBT, BDO, MPI and SMPH). 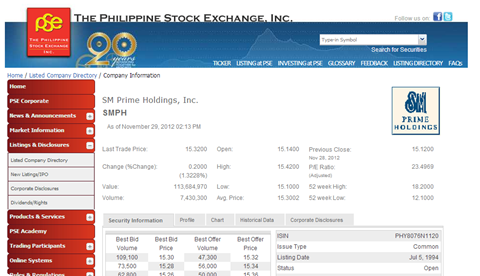 Since I do hold some stocks position at SMPH, I sell part of my stocks to my son at the amount of 15.12 pesos (It is just an internal agreement since he cannot have an account in Citiseconline at his age). My son also decided to give his monthly saving to me in the future to add up is portfolio. He has also installed Bloomberg Applicationon his iPad to monitor the movement of his stocks. There was a time that me, my wife, and my son is watching Warren Buffetinterview, we have learned through that interview that Warren started doing investing in the stock market at the age of 11. I told my son that if Warren started at 11 and he can start at 10 there is a big chance that he will also be a billionaire like him. And I saw a smile in my son’s face. 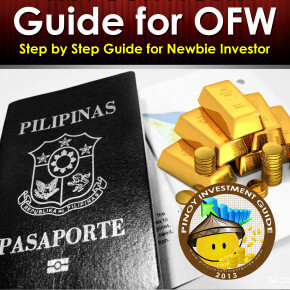 So if my son is now eager to learn the stock market at his early age, why don’t you start learning how to invest also? If only there are people who teach me about investing at my early age, I would have been an investor at my early age. Update: I came to know about ITF From COL which enable my son to have his own account, I will study and inform our readers in the future. Question: Considering the very good performance of the PH stock market, is it the right time to start investing or should I wait for the prices of stocks to decline a bit before I start buying in? how to buy stocks,what im going to do first just give an idea..